I wish I knew what church this was. All I know that it is somewhere in the western part of Ukraine. 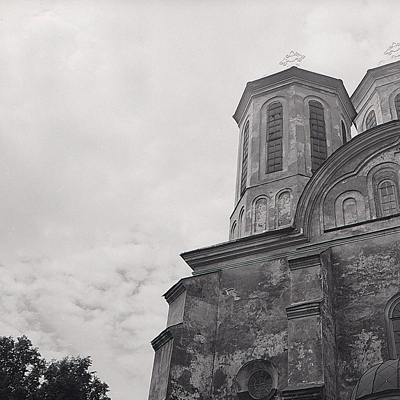 I had just bought a Kiev 88 medium-format camera, some Soviet era film and I was learning how to use the camera. This is probably one of my first photographs that was half decent. The camera, a copy of a Hasselblad had, and still has, many idiosyncrasies that needed to be learned. Here’s the album that introduced the world to scratching, synth funk and the lot. Not really the album actually but the first on the first side. That’s the song that made Herbie Hancock a household name. That’s the song that pas propelled to stratospheric heights on the base of a fantastic video that is still cool to watch today. That’s the song that ushered in the whole synth-sampling pop music phenomenon that we are still in today. Yes, Kraftwerk were doing similar music a decade earlier, but that was infused with Germanic detachment and aloofness. Here you had the funk. Here you had an explosion of soul. 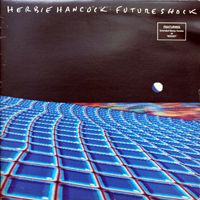 I think there is no doubt that Herbie Hancock was influenced by Kraftwerk and all the other synth pioneers but he elevated the music to a new level. Technology had advanced immensely since Kraftwerk’s Autobahn and Hancock used this brilliantly. The soul and funk influences are really evident on the other tracks in this fantastic album that is forever overshadowed by that one song — Rockit. For me, this is a love/hate wine. The all consuming question is do I hate it or love it passionately? As I write this an sip the wine delicately, I like the wine. Do I love it? Do I passionately love it? No, on the latter but a guarded perhaps, for the former. This is an inexpensive wine. The first taste alone will tell you that. It has an unrefined quality about it. But the thing is that it is not bad. It’s a late night kind of wine. Listening to Leonard Cohen or Tom Waits. Perhaps Edith Piaf. Perhaps a Portuguese singer — but not Nelly Furtado. It is late and you should end the night but there you are. Good music and a fair bottle of wine with a taste that has a presence on the palate. Of course the wine must be drunk out of plain water glasses. I’ve had this wine on several occasions and depending on the ambiance of the time and place it has pleased and displeased me. In some situations the wine did not arouse a passion, either negative or positive, but did not earn a like. Tonight, I am chalking it up in the like category, just shy of passionate. I’ve written about this before. Stuff and things. I have a lot of stuff and things and am getting more and more because it is now garage sale season. I buy something, for very little money, from someone and somehow it becomes useless but precious and dear here at home. The vicious stuff and the horrendous things. Looking for my ink-pad, I have revealed to myself that I have two drawers and a storage box that are chock full of office supplies. I also have a shoe box full of pens. Confounded stuff and terrible things. There will be a good purge tonight. Then a trip to the dollar store to by another ink-pad. I won’t buy any more stuff. Just one thing. We were leaving a cottage on the Magnetawan River. This insect cane to say farewell. 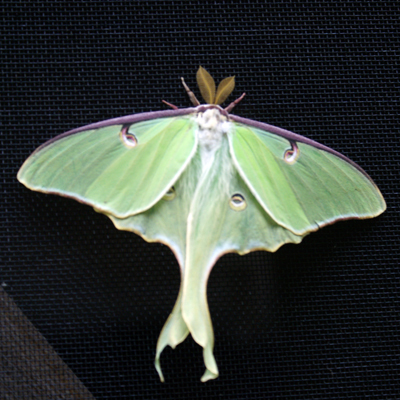 If all the forsaken insects that wanted a sample of our blood were so elegant, we would have stayed longer. I bought this album during the Boxing Day sales from either A&M Records or Sam the Record Man. I know this because there was no other way I would have been able to afford a triple album as a very young lad. Boxing Day, the day after Christmas, was always an adventure — take the subway to downtown, wait in line for about half-an-hour to get into the store and then buy what you could afford. There were always amazing deals on albums on Boxing Day in Toronto. 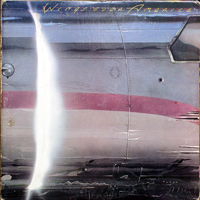 I saw Sir Paul McCartney a while back on the Colbert Report and they noted that this album was being re-released with digital enhancement and all. I’m not going to buy the new CD because I have the original album. I listened to this album a lot. One can say it is well worn. It still sounds wonderful. The band is on fire and is tight reproducing not just their songs but a bunch of Beatle tunes as well. The band is so tight some songs, actually most, sound like they were recorded in a studio with live cheering sounds added in the studio. It’s a good album. I’m glad I hung on to it. I sold most, if not all, my other Beatles albums to finance other record purchases. It is a great live album that presents an artist at his peak. Bulgarian wine. To some this might sound like a frightening idea since Bulgaria is not well known as a wine producing country. I’ve had Bulgarian wine before. While I was in Poland as the whole system was crumbling in the late eighties and early nineties. You bought wine to have a change of pace from the vodka/beer standards. The wine that was readily available was Sophia — named after the capital of Bulgaria no doubt. All I remember is that this wine did not make anybody sick. It was unremarkable to say the least. Now this wine is remarkable in that it is the first wine that I have tried since starting these reviews where the taste matches the price. There is a harsh edge to it. A kind of strange feeling, a sourness, as it washes down the back of my throat. The label proclaims there are sulphites and I think they are here in spades. I took a look at all the reviews I’ve done so far and this is not the least expensive wine but this is the first wine that I’m not impressed with. Drinkable? Sure. But only if you are normally ping-ponging in a vodka/beer loop.